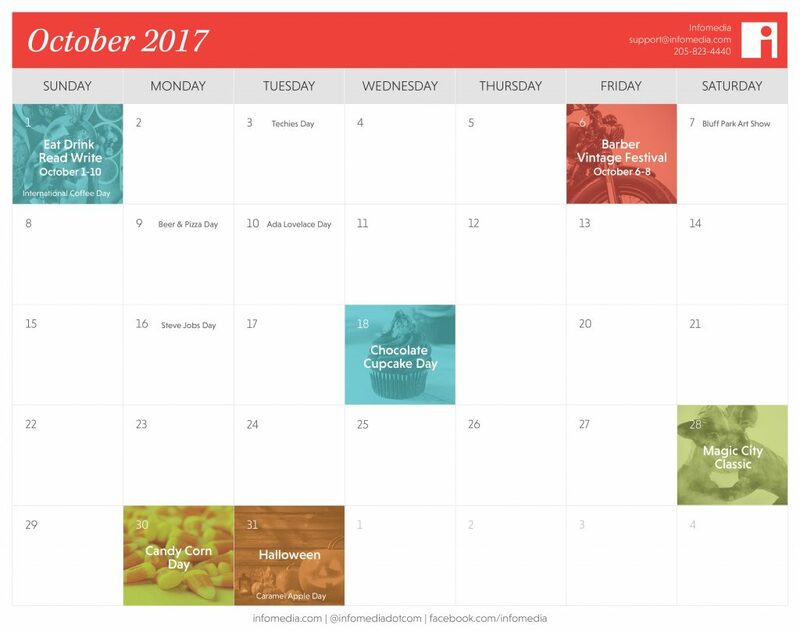 Treat Yourself to our October Calendar | Infomedia, Inc.
Are you looking for a fun office outing, or just content to keep your site’s content fresh? Fall festivals and some super-important tech innovators get the spotlight. From local events to silly holidays, use this season as inspiration to keep your editorial calendar on track. Book lovers, vintage car enthusiasts, creatives and those who love good old-fashioned football rivalries will find lots to enjoy this month. Eat Drink Read Write, the Barber Vintage Festival, the Magic City Classic and the Bluff Park Art Show are all planned during October. These local events are happening in different areas throughout the city, giving you a chance to see what Birmingham has to offer locally. Tired of recycling pumpkin spice products and hayrides in your Instagram feed? Totally understandable. For fall-themed fun, incorporate Beer & Pizza Day, Chocolate Cupcake Day, Candy Corn Day or Caramel Apple Day into your office festivities. (Hey, we love any excuse for an office party.) Of course, Halloween is this month too. Last year Infomedia’s annual office costume party incorporated a social media contest with great results. The tech world’s movers, shakers and innovators get a lot of love this month. Be sure to shout out your favorite techies on October 3. Likewise, you can celebrate Steve Jobs on October 16 or Ada Lovelace — the mathematician historians believe was the first computer programmer — on October 10.